My husband is always looking for new things to take to work for breakfast. He needed something new. Lately, he has been taking my banana muffins or pumpkin spice muffins, but this is definitely switching it up a bit. That’s why I made these Healthy Tropical Breakfast Bars for him. They have all the flavors of a pina colada. Yes, please! The perfect bite of sunshine to get you through these last cold days of winter. I made mine with a coconut frosting, but you can totally eat them without it as well. I used almond butter in my bars because that is what I had on hand at the time. However, I think cashew butter may be even better. I am definitely trying that next time! These bars are vegan and gluten free. They are also free of refined sugar. These Healthy Tropical Bars also travel well. If you wanted to make a grain free version, you may be able to sub nuts for oats. If anyone tries that, please share the results in the comment section. We shot a quick video for this recipe as well. You can view it below. For more recipe videos, you can subscribe to my You Tube Channel. 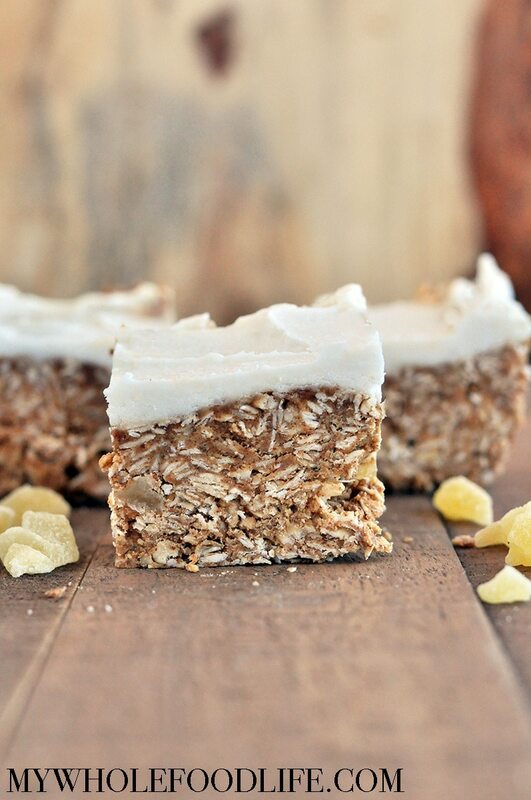 Taste some sunshine for breakfast with these Healthy Tropical Breakfast Bars. Bursting with flavors or coconut and pineapple. Vegan and gluten free. 1/4 cup coconut butter , warmed or slightly softened. In a large mixing bowl , combine the almond butter, maple syrup and coconut oil. Stir well. Then add in the oats, coconut and pineapple chunks stir well. Press the mixture into a parchment lined loaf pan. I used one about this size . Place in the fridge while you make the frosting. In a small mixing bowl or measuring cup, add all the frosting ingredients and mix well. Use a spatula to spread the frosting on the top of the bars and place in the fridge to set. Keep these bars stored in the fridge. They should last a few weeks that way. Enjoy! How do you think sunflower buyer would do? We have to be a nut free home and I have been looking for breakfast bar ideas. these look amazing, but I cannot have oats, any suggestions for sub? Can you have quinoa flakes? probably, I will try that. Sorry, I didn't read the full post first (you did mention you could sub nuts) I am not gluten free, but for some reason Oats make me very sick. Thank you! You're welcome! If you try with quinoa flakes or nuts, please let me know how it turns out. Amazing Post. Thank you for sharing the recipe.